Thanks once again to Nick James at the Mushroom Works in Newcastle for organising a successful weekend of carving courses. The weather was a bit snowy up there in the North East, but everyone made it to the venue and there was some really excellent work. 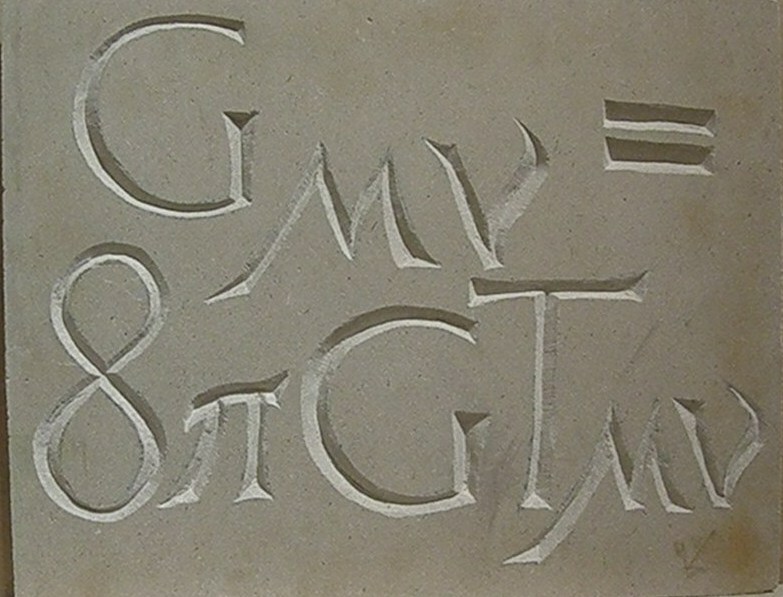 Linda (whose husband is a physicist) made Einstein’s field equation – the first time we have seen a scientific formula in stone at one of our courses! I think you’ll agree it’s very original and also very impressive work for someone new to carving to achieve this in a day.Linda followed this up with a horse relief on the second day. Ian also did a lettering piece on the Saturday, he did eight letters – ‘SLOW FAST‘ and executed them with precision and style.